Rabindranath Tagore(1861-1941) - 'Gurudev' of the whole India, who bestowed the title of 'Mahatma' on the father of our nation, who gifted us our identity and whose verses are sung every day at every nook and corner of our country in the form of our National Anthem - is not called the 'Complete Institute of Literature' for nothing. Tagore is one of the greatest poets and thinkers India has ever produced. I know my words will miserably fall short of the kind of paeans the person of his stature deserve. However, I feel extremely glad to be reviewing a few of his works here. I think every kid grows up hearing this - you are in the best phase of your life - Childhood and you are not realizing it. I did, when I was in my childhood years and now being a mother of two, I find myself telling the same to my kids. But then I realize perhaps that is the best part of this phase - kids do not consciously live or not live a day and their small world and its issues are big enough for them. In fact, when the kids watch adults getting to exercise so much control over all the significant issues, decisions and also on them, they can't wait to grow up. This is the essence of 'The Little Big Man' who wants to be as old as his father because then nobody would tell him to learn his lessons, he could leave his books, he would go wherever he likes, he would buy his own clothes when he likes and he would give money to whoever he wishes to. 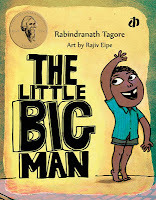 Through 'The Little Big Man' Tagore peeks into the mind of a little boy who is looking forward to growing up and to assume adult responsibilities. The art work by Rajiv Eipe perfectly compliments the text. The little boy with front tooth missing looks absolutely endearing in his expression of - all grown up and responsible. Rajiv is involved in doing animation and graphics for Television. A charming tale of a little girl who is tempted time and again by the clouds and the waves to join them in the games that they play in their magical world. The world where they play with silver moon and golden dawn. For a child this surely is an irresistible temptation but she simply declines their invite every time because what she likes the most is to be with her mother. She does not need to go to any enchanting world when she has nicer and better games that she can play with her favourite playmate. A sweet little tale conveying the tender love between a mother and her little one. The illustrations that spread across both the pages are beautiful art work. The inquisitiveness of the little girl, her full-of-life twinkling eyes and the tender affectionate bond that she shares with her mother are brilliantly captured by the illustrator Sunaina Coelho. 'The Land of Cards' is a potpourri of some of Tagore's best works - poems, short stories and plays, translated from Bengali to English by Radha Chakravarty. A wonderful assortment to give children a little glimpse of the beautiful world created by Tagore's pen. Poems - which offer different flavors in each piece - ranging from hilarious odd rhymes like the one in which a cat is trying to convince the fish to be its meal, to the ones which are brimming with sensitive emotions. The entertaining 'The Invention of Shoes' tells the story of the birth of shoes while the 'Hero' reveals the inner desire of a son to be by her mother's side and to protect her always. Through the poems like 'Two Bighas of Land', Rabindranath Tagore took up the social issues which were suffocating our country in ancient times. The title play 'The Land of Cards' brings out the conventional restrictions of the society and in another play 'The Post Office', a boy being restrained to closed confines tries to live his life through the people who are busy in seemingly mundane activities in the free outside world and unknowingly teaches them the lesson to take pleasure in whatever they are doing. 'Kabuliwala' - a simple story bringing out the yearning of a father for his daughter, is one of the great classics which are lustrous ageless gems. I remember having enjoyed reading this story as part of course book during school years. Such are the pieces of writings which defy all barriers of age and time. 'The Land of Cards' is a book which can be read, enjoyed and appreciated by children and adults alike, offering them a peep into the world of literary genius. 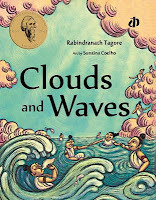 We have a couple of other anthologies of Tagore's works - for children. Will pull them out and put it here in the comments. But did not know about the Katha books, will go look for them - thanks! We have Land of Cards. The story about the bird in a golden cage, its allegory to the education system simply touched my heart. Thanks for the review Vibha. Lovely, Vibha. Love the works of Tagore- one of my favourite poems is 'The Postman' by him. I have an anthology of his stories for children that I have been reading to A- will certainly look out for these others. I have also been looking out for his stories in a Hindi translation.